Over at Oliver + S, we had a best-selling pattern for girls last year called the Ice Cream Dress. I can’t tell you how many woman asked for this dress in their size. I tried making it for myself, and although it was cute I knew we had a better option in the works for women: the Portfolio Dress! I’ll let you in on a secret. This dress is my favorite of all the Lisette styles for this season. It’s cute as a dress, as a tunic, and as a blouse. I like the three-quarter-length sleeves, and I also like the short sleeve options with the contrast yoke and cuffs and the gathered detail at the center front. I like that it doesn’t require zippers or buttonholes (there are two button loops at the back neck instead), the flattering cut, the casual styling. And my favorite part? The pockets. You can use two contrasting or coordinating fabrics, like we did here, or just one fabric. I’ve been wearing the dress version in a chambray linen and the tunic version in a beautiful Japanese double gauze that I bought at Alewives Fabrics in Nobleboro, Maine, when I was there teaching a workshop last fall. This is an easy summer piece that can double as a swimsuit cover-up, but it’s equally cute with heels for an evening out. 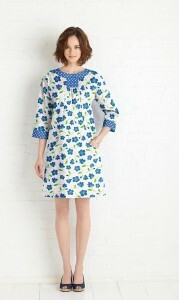 The pattern also includes a cropped, slim-fitting pant that looks great under the tunic or with the blouse. The pants have little buttons tabs at the hips for a nautical feel, and you can easily leave them off for a clean, sleek look. If you see me this summer, chances are good that I’ll be wearing something I made from this pattern. I love these pants! The perfect length to show off those fabulous shoes! I think this is my favorite one too! I can’t wait to get my hands on the pattern! I think this is my favorite dress. It is so retro yet so flattering for those of us ladies with “generous” hips :-). I’d love to try it! Hi again, one question. Since these are Simplicity patterns, are they available at stores like Joann’s or only through your website? Thanks! This dress is super cute! I can’t wait to get my hands on this pattern and make it!! Nice portfolio. I love the background. Very nice pants. I love, love, love this dress! It is the most comfortable, flattering dress I own and am planning on making more. It is also the first dress I have ever made with my first sewing machine! I cannot wait to make the tunic, blouse, and pants! Thanks, Liesl + Co.!